Nurses work long hour shifts, dealing with many highly stressful situations throughout the day and as such they need to be comfortable to be able to perform optimally. Typical Nurses attire consists of a lab coat, a pair of scrubs (top and bottom) and a pair of comfortable shoes. Being comfortable is essential in to the profession. Sore, achy tired feet do not make forcheerful nursing which in turn affects the quality of service being rendered to patients. The scrubs and lab coat need to be loose fitting made from cotton and “breathe” to allow for cooling and sweat absorption. The shoes need to be extremely comfortable. 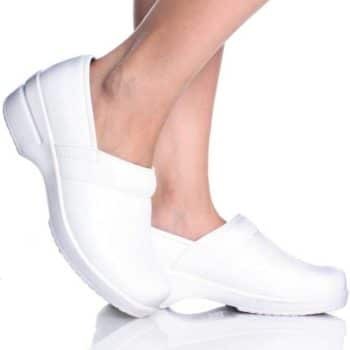 Comfortable shoes are an absolute necessity because nurses stand for incredibly long hours and are carrying the full weight of the individual. Very important that the sole (underside) of the shoe be slip proof. Choosing the right shoe for you can sometimes be easier imagined than accomplished. However, you can rest assured that one of the best ways to get your hands on the most comfortable nurse shoes out there is to focus on brands and styles that have a great track record for getting even the hardest working nurses through their days. 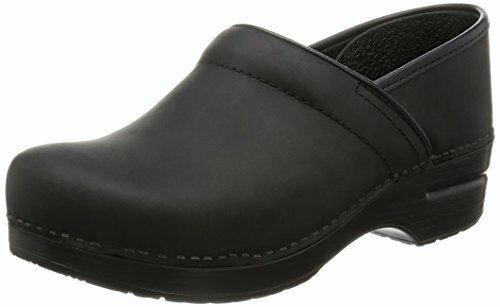 After days of research, we came up with the most comfortable nursing shoes available on the market right now. 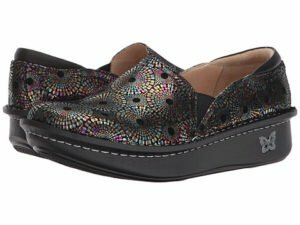 It is hard to find a more comfortable shoe than the Quantum Women’s Slip On designed by Nurse Mate, a company that nurses have come to depend on. The shoes include a Pillow Top footbed that provides the ultimate comfort for your feet. The unique DRYZ technology works by absorbing moisture and perspiration to keep your feet dry and cool all day long. The shoe is also designed with composite shanks that add extra support to the shoe and provide more stability. The leather uppers are stain-resistant to add to the life of the shoe. This shoe was specifically designed for women who are required to stand on their feet all day, like nurses. 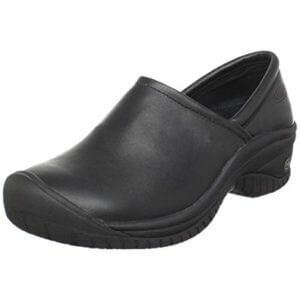 The memory foam footbed is extremely soft and provides comfort for your feet throughout your entire shift. The medial side gores works to help the shoe conform to your foot adding to the comfort level. 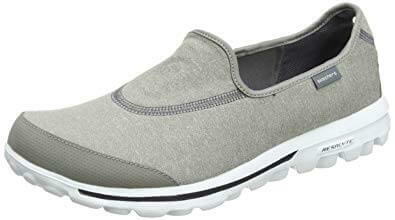 The slip on design also makes getting in and out of these shoes quick and easy. In addition, the slip resistant sole prevent unnecessary falls. The water resistant leather uppers are easy to clean and maintain. 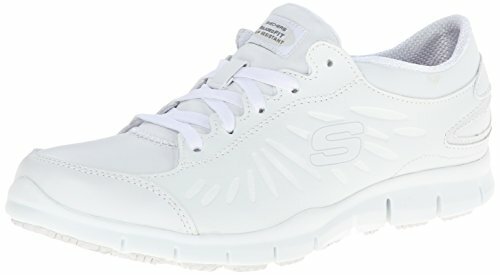 This shoe proves that Sketchers are not just for the gym. The D’Lite SR Work Shoes are specific designed to provide comfort even after extended period of standing and/or walking. The shoes are made with lightweight leather upper that put less stress on the feet and legs. The interior is completely padded with soft cushion material, including the tongue and collar. The shoes include a removable insole that allows you to easily replace it with a custom insert. 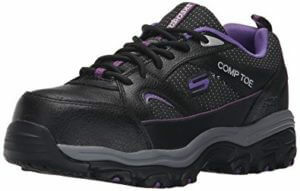 The skid-resistant and safety toe design prevent falls and improves your stability. Alegria is a brand name that nurses can trust. 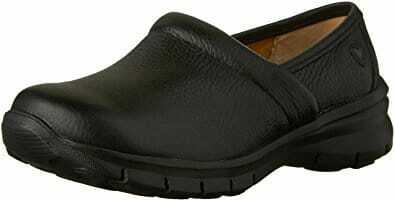 Their Debra Professional Slip On are among their most comfortable shoes on the market and is stylish at the same time. The shoe insole is made with cork and latex, which makes it extremely soft and actually allows the shoe to conform to your foot. The goring sides add to the comfort of the shoe and makes them fit better. The leather upper are stain resistant and can easily be wiped clean. The slip-resistant sole is made with the Rocker design that adds to your stability and takes that pressure off your feet. 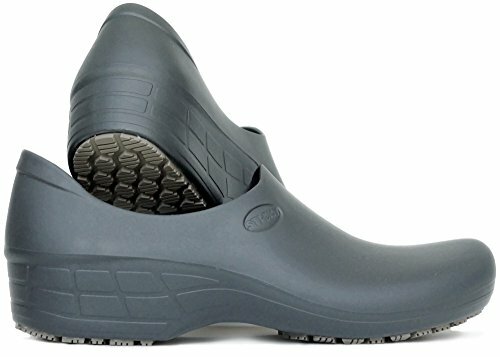 This classic looking shoe is designed to protect and comfort your feet during the long hours at the office or hospital. Several special features are included in this shoe’s design to add to its comfort, including arch support, a contoured midsole, and shock absorption capabilities. The insole includes extra padding that conforms to the shape of your foot. The sole is made with the Rocker design to improve movement and reduce pressure on your legs, knees and feet. 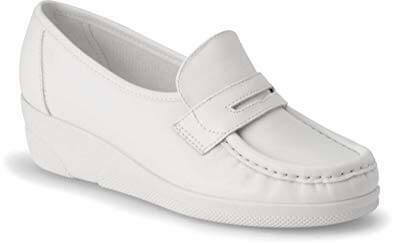 Some nurses prefer a footwear option that is less like a sneaker and more like a clog. 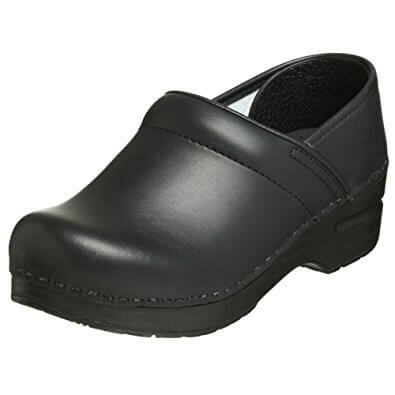 Nursing clogs like this stylish, simple option from Dansko include standout features like a PU outsole for unbeatable shock absorption and lasting durability will make even double shifts pain free. Supple leather construction and high quality man made soles ensure that your clogs will get even more comfortable the more you wear them. Platform soles and a curved design allow this shoe to mold itself to the natural contours of your foot. 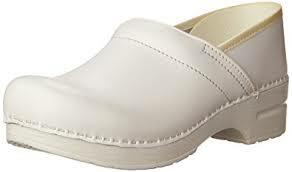 No wonder Dansko is known in many circles for making the most comfortable shoes for nurses known to man! Nurse Mates is known the world over for making some of the nursing shoes most comfortable to be found anywhere. These feature a comfortable Mary Jane style that is as good-looking as it is effective at keeping you comfortable. A stretchable strap and a handy hook and loop closure make it easy to adjust your shoe for a perfect fit. A generously padded pillow top insole makes working for hours on your feet a breeze. Nurse Mates shoes are durable and utilitarian as well thanks to a slip-resistant sole and a high quality leather/nylon construction that stands the test of time. 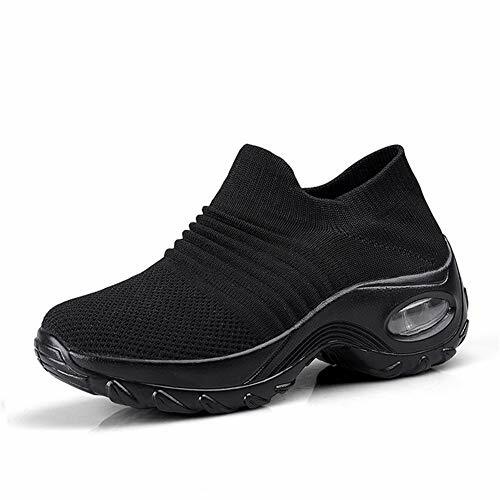 If you’re looking for the most comfortable shoes for nursing that are capable of fitting into any budget without compromising on quality, then give these ultra-comfortable slip-on sneakers from Skechers a try. A generously cushioned foot bed combines with shock-resistant leather soles and a padded ankle collar to help you through long days on your feet. A combination leather and synthetic construction strikes a great balance between value and durability. These shoes are great looking as well – something that you can wear with pride even when you’re not at work. We’re lucky to be living in a day and age where variety and choice are the order of the day, especially when it comes to good quality professional footwear options for our hard-working nurses. Start exploring the many options out there for yourself today! You’re sure to be glad you did. There are hundreds of varieties and styles of shoes for nurses currently available on the market today; making an informed decision about the type of shoe your body needs is critical in preventing injuries or discomfort. Thankfully, the nursing industry has recognized that every foot is different and accommodating the wide array of feet on the market isn’t just available in speciality stores – you’ll find options regardless of where you go. Choosing the good comfortable nursing shoes starts with understanding how your feet work and the type of foot you have. Generally speaking, there are three types of feet. The flat-foot is a foot that suffers from minimal to no arch within the foot. Those suffering with flat-feet are also chronic sufferers of over-extension of the foot, causing an inward rolling sensation that can lead to multiple injuries or ailments. Finding a shoe that offers support and cushioning, but does not put pressure on the arch is important. Many times people purchase shoes with a predetermined arch, causing excessive pressure to be placed where the natural arch would have been. This can cause pain, discomfort or worsening physical problems with continued use. The second type of foot is the neutral foot. This foot is the most biomechanically sound foot, offering stability and function at a higher rate than the other two options. These feet adapt well to shoes offering arch support that is pliable and well-cushioned. Finally, the final type of foot is a high-arch. This is an overly-compensated arch that is the polar opposite of the flat-foot. The high-arch often creates an overly rigid foot, making proper mobility nearly impossible without the proper support. These feet generally respond well to a higher arch shoe; accommodating the higher structure of the feet. Regardless of the foot type, it’s important to consider all aspects of your feet when purchasing your shoes. Considering the toes, heel, arch, ankle, arch and sides of the feet are all equally important. That’s why you should have a shoe with a pliable but sturdy sole; allowing fluid movement and impact points; proper, the top of the shoe for wicking away moisture and sweat; adequate spacing for the toes and a supportive, secure ankle to keep the foot in place while moving around. Remember, your shoes will be worn for excessive periods of time throughout the day, keeping them comfortable is the easiest and safest method to avoiding injuries or discomfort throughout the day. A well-fitting pair of shoes should feel like an extension of the feet – not like a heavy bricks attached to the bottom of your feet. While shoes might not seem like a vital portion of your uniform, staying in comfortable shoes is important to all components of your career. It affects your body, mind, and even your performance. After all, staying focused and attentive is important for your job; if your body is aching and sore, you’re not as agile as you should be. Remember, you only have one pair of feet – help them endure the daily impact of your job. As a nurse, you quickly realize that the most important part of your wardrobe is your work shoes. It is imperative that you find a shoe that is able to keep your feet comfortable for 10 or 12 hours at a time. The good news is that there are several different styles of shoes that have been designed specifically to protect and comfort your feet. They will provide you comfort through the duration of your long shifts. The trick is to find the perfect shoe for your feet. Above is a list of the most comfortable nursing shoes on the market to help you find the one that is best for you. I’m wondering what other people think about their nursing shoes. Tell me about your experience in the comments below. Also, We have compiled a comprehensive Guide to Best Shoes for Nurses for you, don’t forget to check it out.